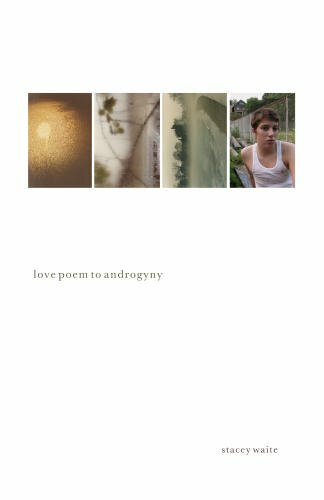 Stacey Waite’s chapbook Love Poem to Androgyny is the winner of Main Street Rag’s 2006 Chapbook Contest and an incredible collection of poetry. Jan Beatty describes these poems as having “no coded language, no playing dress-up here.” They are not only beautiful and moving, but highly accessible. The first third of the collection begins with the poem, “In the Womb” and progresses through adolescence. While the form of the poems sways from short, tight lines to gain bulks of text, each compliments the content of the work. These poems bear witness to a struggle with identity in a sensual, yet vulnerable and honest manner. Waite then moves into a series of poems, “On the occasion of being mistaken for a boy/man…” This series contains poems of long lines and long stanzas, which convey a very narrative, almost casual tone to the poems. They are simultaneously funny, heart-breaking, empowering, awkward, and thought provoking. Lines such as, “before baseball and the movie Dirty Dancing/because don’t we all want to be Patric Swayze exemplify this. The final third of the collection seems to be poems that are more reflecting, a response to the incidents in the “On the occasion” series. Last year, I had the great privilege of seeing Stacey Waite read in Pittsburgh. S/he was a phenomenal reader, engaging and personal (and totally hilarious). If you ever get the chance, you should absolutely go see Waite read. I would highly recommend her chapbook for anyone interested in gender studies, or just looking to come to a new understanding of gender. Craft and content-wise, these poems are great examples of powerful, moving poetry. Also, many readers complain that they don’t like poetry because it is “hard to understand.” These are poems for those readers, too. They are in your face and brutally honest, but they will make you think.